The compact SUV segment seems to be hotting up with the soon-to-be launched Hyundai Creta, and Maruti Suzuki S-Cross gearing up to join the party. Current players – Ford EcoSport and Renault Duster – have two genuine reasons to worry about as one is all about premium-ness and other is about affordability. Unfortunately, we haven’t driven the S-Cross, therefore we can’t add this vehicle in this comparison. Let’s start with the new kid on the block, Creta. This Hyundai SUV will be available with three engine options – 121bhp, 1.6-litre petrol and two diesel variants 1.4-litre and 126bhp, 1.6-litre, which has the most powerful output in the class. The Creta is also the only SUV in the segment to come with an automatic diesel variant, which is powered by the 1.6-litre engine and is mated by a 6-speed transmission. The Ecosport, on the other hand, has two petrol options – 123bhp, 1-litre EcoBoost and 110bhp, 1.5-litre – and a diesel 1.5-litre engine with 90 ponies. And finally the Duster too has three engine variants. The 1.6-litre petrol pumps out 102bhp and the 1.5-litre diesel is available in 84bhp and 108bhp trims. Among the three only the Duster comes with a 4-wheel drive variant, therefore, if you have an adventurous streak then you take this SUV off-roading without worrying about the consequences. No doubt the Renault feels solid build but it is starting to show its age, while the Ford and Hyundai look a lot more contemporary. The EcoSport comes across as a hatchback on stilts while the Creta is more like a mini Santa Fe, which is a good thing, while the Duster has the more traditional SUV looks. 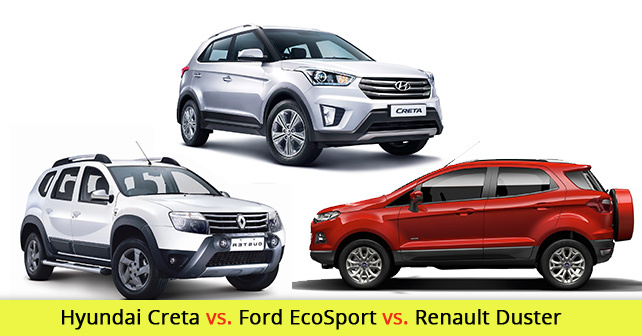 The top models of the EcoSport and the Creta come equipped with 6 airbags compared to Duster’s two. Where the EcoSport sadly loses out is in cabin space. The rear passengers have just about enough legroom, if they are less 5 feet 10. Also it lacks shoulder room. The Duster has plenty of space and has a very airy cabin. It offers better visibility, as the EcoSport’s thick A-pillar and small quarter glass and the Creta’s C-pillar create a blind spot. The Creta offers phenomenal legroom for passengers sitting in the back, but unlike the Duster, three adults sitting in the rear can be a bit of a squeeze. In terms of equipment available, as expected the Creta leads the away with 6 speakers, 6-inch touch screen and an infotainment system with an in-built 1GB memory space. The EcoSport has the path breaking infotainment system – SYNC – which pairs with your smart phone and lets you make your calls hands-free, reads out your messages and even choose your favourite tunes saved in the mobile phone. The Duster recently got an upgrade and now flaunts a new in-car media system, which comes with a navigation system. Below we pit the Creta 1.6-litre diesel against the 1.5-litre EcoSport and 1.5-litre Duster, specifications wise, which gives a clearer picture on how the new SUV fares against the competition.